Since 1985, Delifrance is the first cafe in Singapore to offer French baked goods that are closest to the Parisian charm. Their evergreen line of viennoiseries like the croissant and baguette are still one of my favourites to date. The French-style cafe recently launched a new croissant flavour, including three new tarts and two madeleines flavours. Distinctly French, the signature croissant gets a new twist as the bread is finished with generous toppings of crispy almond flakes and snow powder – rich and buttery interiors, crisp and flaky layers with a sweet taste of “snow”. 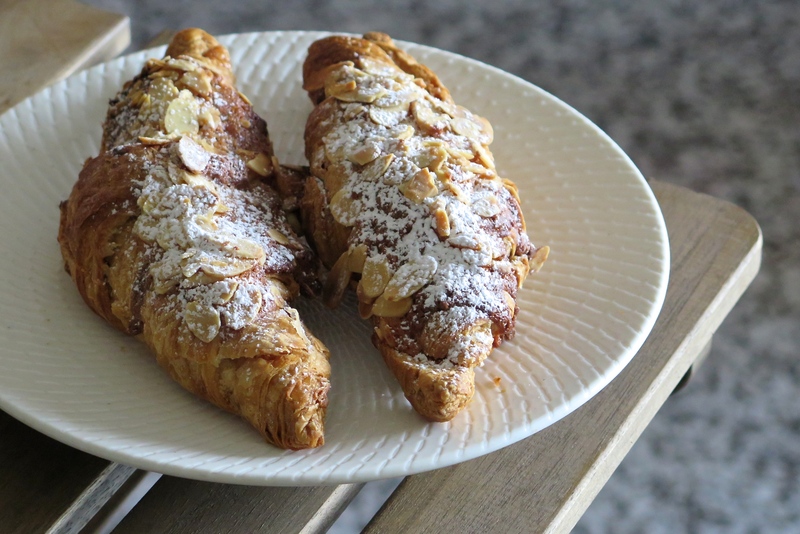 The Almond Croissant ($4.50 each) is perfect for an afternoon break, best served with a cup of coffee or tea. Regular croissants are available and still taste as good as ever. 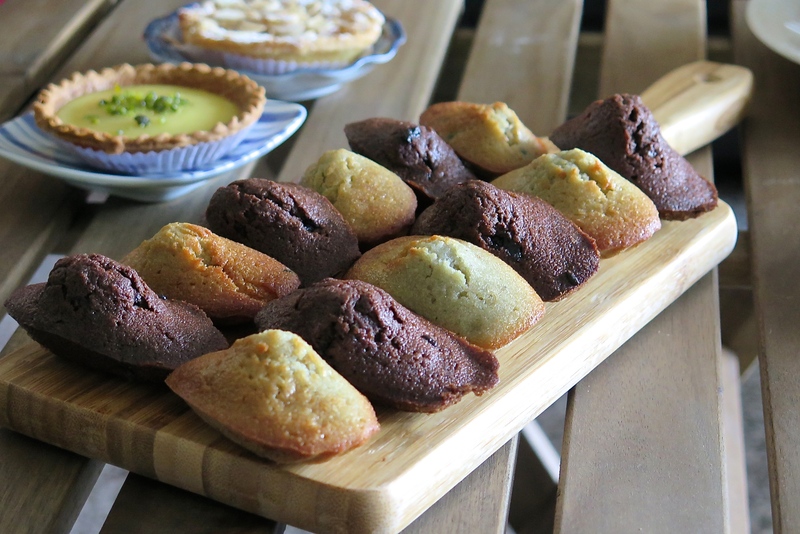 Madeleines – that little French butter cake now comes in chocolate and blueberry flavours. At $4.80 for a box of six pieces, these delicate scallop-shaped petite cakes have crisp and ethereal exteriors and are incredibly moist and fluffy inside. 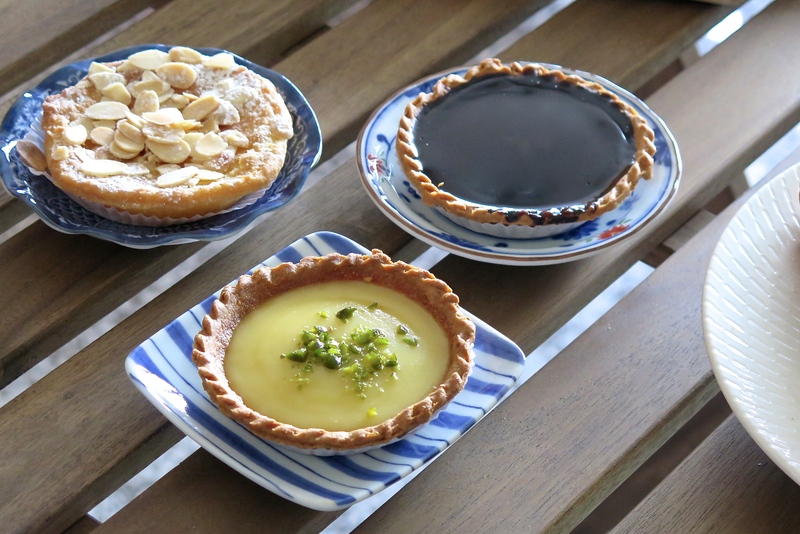 The Lemon Tart ($4.50); Almond Pear Tart ($3.80) and Chocolate Tart ($4.50) has a crumbly and crunchy tart base which is made of ground almond. The lemon tart has a creamy smooth lemon filling made from fresh lemon juice, lemon curb and a thin layer of white chocolate to balance to the tangy and zesty flavours, then topped with bits of pistachio nuts. Belgian chocolate is used to create the velvety filling in the chocolate tart. Bite into it to reveal two luscious layers – a glazed chocolate top layer and a layer of ganache with 64% chocolate content. The almond pear tart is filled with slices of pear and almond cream, and finished with abundant amount of almond flakes and confectionary sugar garnishing the crust. Delifrance new sweet offerings are available at all participating outlets except Great World City, OneKM, Parkway East Hospital and Changi Airport Terminal 2. Readers of Alainlicious.com can enjoy two new tarts at a special price of only $5.00 (U.P. $9). Like Delifrance Singapore on Facebook. Tag a friend and Delifrance Singapore. Both of you can enjoy two tarts for the price of one. 5 lucky readers can stand a chance to win $50 worth of Delifrance dining vouchers. The promotion starts today from today till 19 November 2015. For more promotions and outlets location details, visit www.delifrance.com.sg and follow them on Facebook.